Alice had a top 37 things in her pannier, I have a top 11 in order of most importance. You may notice there’s a lot of things that go in my belly, it’s hungry work this cycling lark. 2) Lager – After six hours in the saddle, one of these little buggers caressing your dry throat is a almost as good as a thigh/arse massage. 3) Banana – If my mam were here she’d say “you’ll end up looking like a banana if you eat any more of those” But she also used to say my eyes would go square from watching to much TV, so I’m gonna keep at em. 4) Merino underwear by Finisterre – Lightweight, super comfy, I’ve actually ridden in them for a few days straight and they don’t smell, honest, ask Alice. 5) Coffee – Eye opening stuff! Black, two sugars (level teaspoon) in my own man cup is the perfect start to the day. I’m positive it’s helping me get up some of these hills. 6) Sunnies – Not one bug in the eye yet! 7) Head torch (Bear spotter) – I’ve scrambled round the tent on many spooky night looking for this bad boy to check out the noise outside. No bears yet though. It also helps with evening reading and doing other things in the dark. 8) Pioneer Mix – Man I go through some of these. Feels like I’ve got nuts in my mouth all day;) waahaay… Very nutritious I’ll have you know. 9) Finisterre Jacket – Early morning descents have been exhilarating and comfortable, campfires have been a joy and it’s a bloody awesome pillow. 10) Sharkies – Organic all natural energy sweets that remind me of one of my best mates cos he’s got an unhealthy love for the men in grey suits. 11) It’s low on the list because it hasn’t been super hot yet but I know it’s gonna save my forehead real soon. Smells like coconut. We have had such a blast whizzing along on the wide shoulders of the 101. There has been a steady northerly wind on our backs blowing us to the border and tomorrow we will be crossing into California. 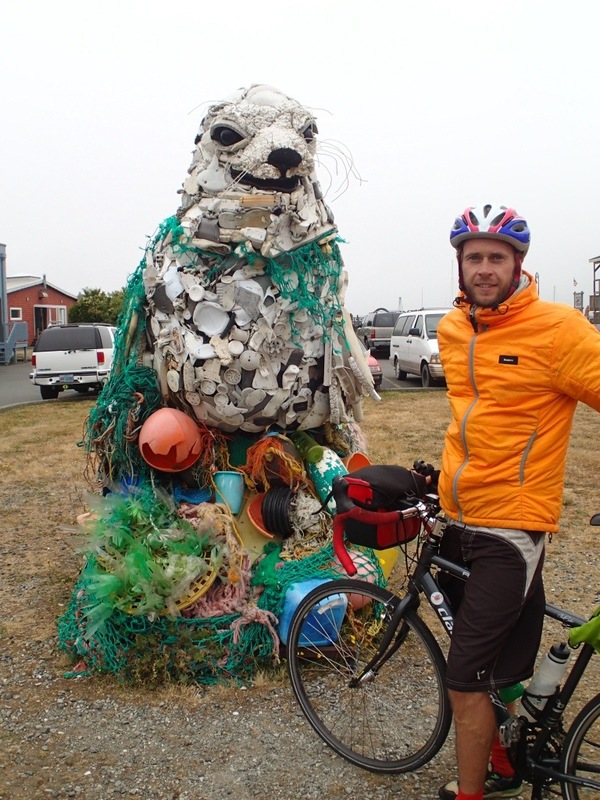 Last night we stopped the night in a little town called Bandon after seeing a 12ft seal made of plastic marine litter. It just so happened that there was an exhibit and workshop of the seals friends (turtles, jelly fish, whales, and other ocean themed displays on show). 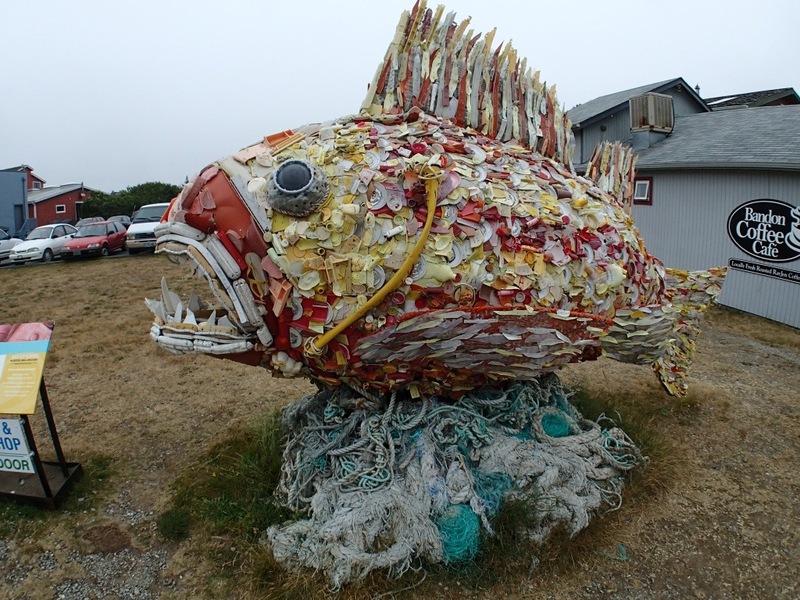 The works of art belonged to the Washed Ashore project who are touring the US with the exhibit to educate huge coastal and inland communities about the catastrophic amounts of litter washing up on the shore lines. 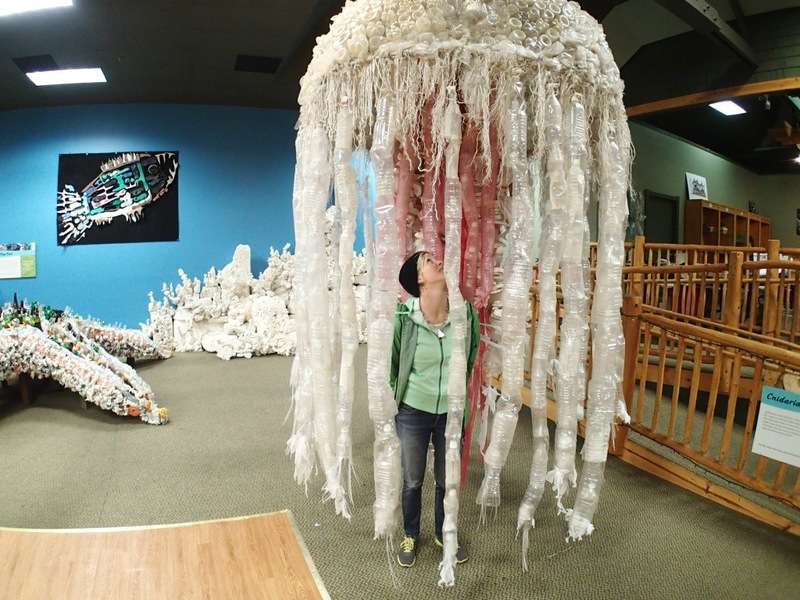 The project was founded by artist Angela Hazeltine Pozzi who was from Brandon, and all of the features are made by volunteers with plastics found on Oregon beaches. We thought their project was pretty outstanding to say the least and were also impressed by their retail section where you could buy biodegradable cornstarch buckets and spades, flipflop jewellery and thought provoking postcards. Check out http://www.washedashore.org for more info. 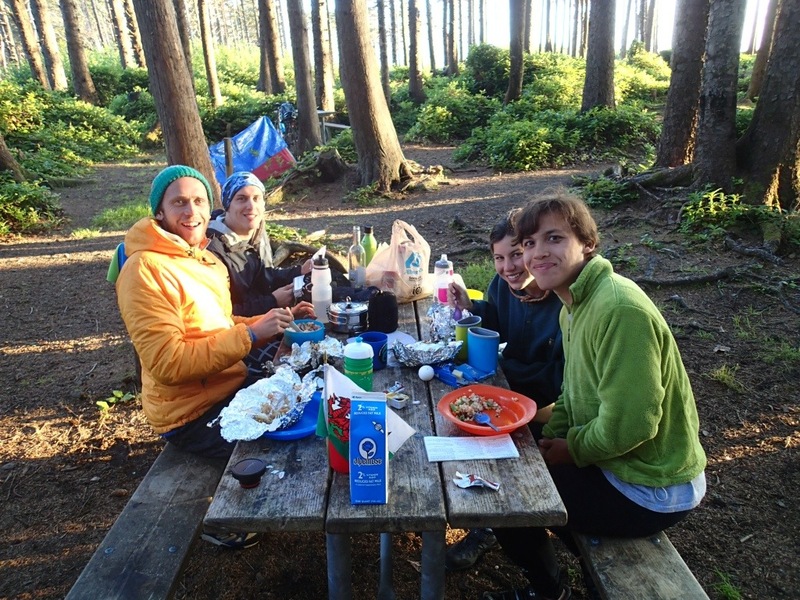 We have been in Oregon for seven days and six of those nights were spent in some absolutely awesome Oregon State Parks where we camped in our wonderful little tent in the hiker/biker site. 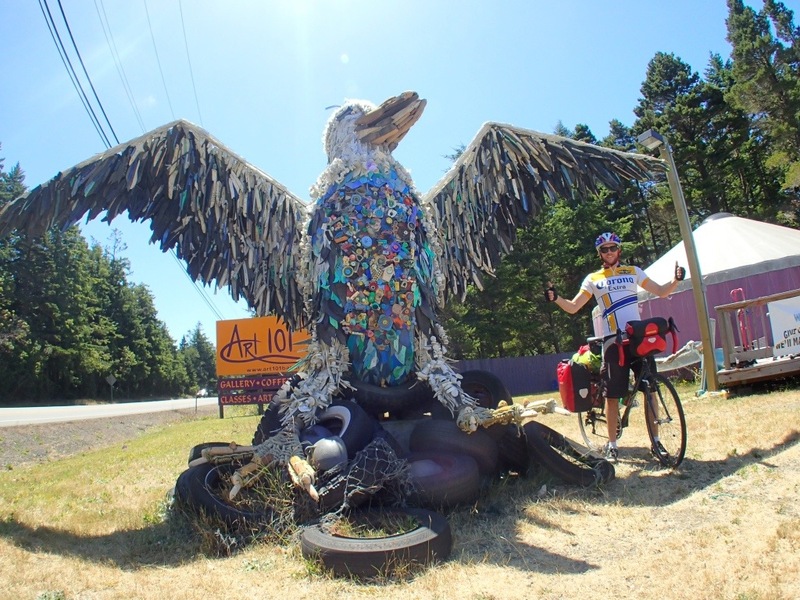 This is an area ranging in size and comfort dedicated to people like us cycling/walking the coast, so they become a hub of connectivity and stories as people chat around campfires about the trials and tribulations of life on the road. 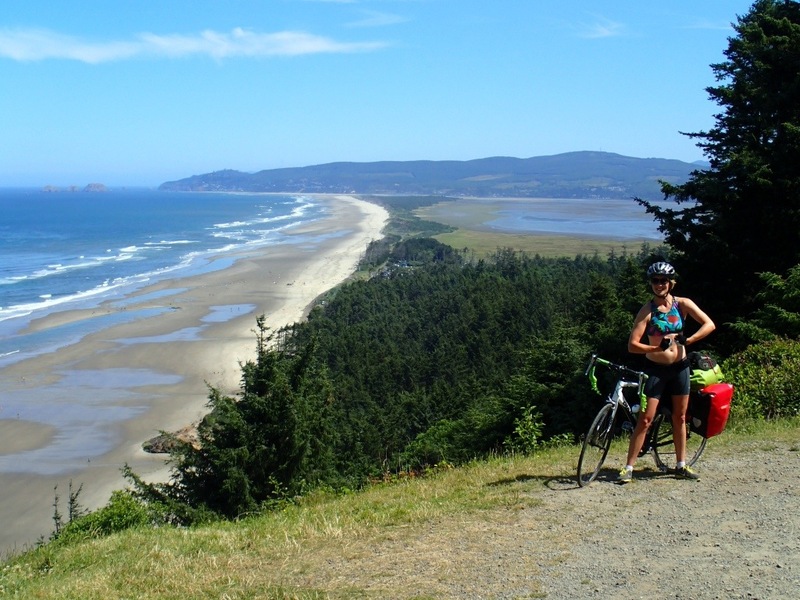 They only cost $5.00 US per person (about three quid) and in all the Oregon state parks the hot showers are free which is a rarity here in the US and welcomed after a day in the saddle. 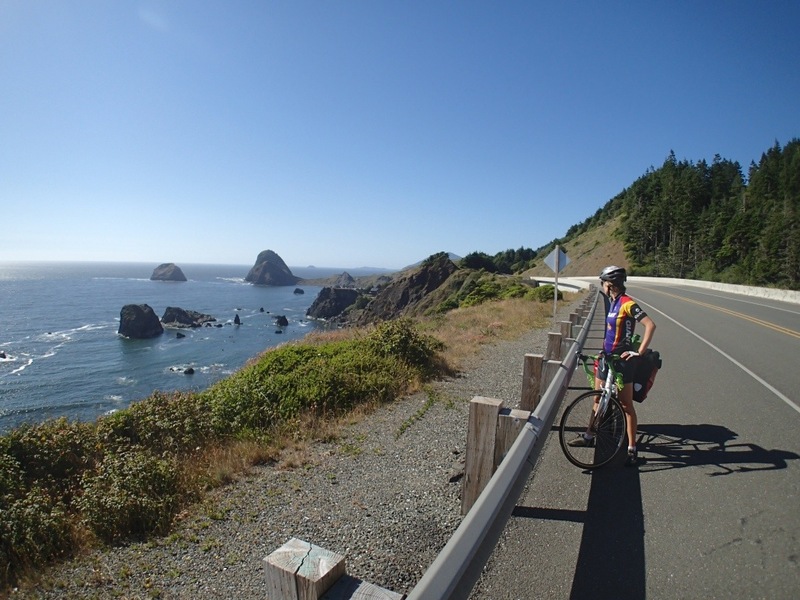 Enjoy some of our favourite photos of the last week and we will write soon from Northern California!